Key Players - Chris Joyce – drums. Tony Bowers – bass. Tim Kellett – trumpet and keyboards. Fritz McIntyre – keyboards and backing vocals. Ian Kirkham – saxophones. Heitor T.P. - guitars. Mick Hucknall – vocals. Overview - This was the third full length album from Manchester England band “Simply Red”. This would be the bands first number one album in the UK and it would sell over 500K copies in the US alone. Defined as “blue-eyed soul” music they'd blend pop with jazz and reggae to outlast many bands in doing so. They'd sell more than 50 million albums world wide. 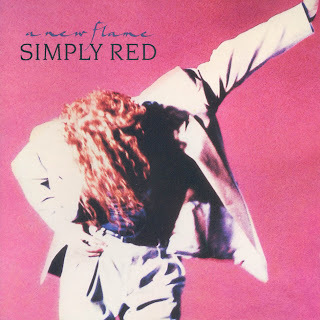 Around the time of this album Hucknall started to call the band a “solo project” and that started to stain things and members would leave the band. Even with that news the “band” would continue on for close to 10 more years. "To Be With You" has the full horn section and slapping drums. If you close your eyes you can visualize the dark and smoky room filled with this music. A solid track that showcases each section of the band. “More” brings the percussive instruments back and Hucknall is a bit more hushed allowing the keyboard to lead the progression but Hucknall really showcases his range later in the track.. “Turn it Up” is more in the vein of the uptempo soul, where the band really seems to shine (at least to these ears). The full horn section is always a treat. “Love Lays Its Tune”mellows it back down and the band finds their deep groove. “She'll Have To Go” has and 80's pop synth intro. "If you Don't Know Me By Now" is their cover of Harold Melvin and the Blue Notes classic. The song would go to #1 and the cover is probably heard more these days than the original. The album concludes with “Enough” and bass and synth heavy soul review. Where are they now? - The band released their final studio album in 2007. Hucknall then released a solo record and the band would reform for a final one off show in December of 2010. FDF Overall Take - The album has what is advertised, some really soul based tracks. It is probably overlooked because of its age, but the band fully compliments each other and their sound. A best of collection might be the best route for most to take, but this is a pretty solid and rewarding listen. Overview - This is the fourth full length record by UK “urban folk” artist Billy Bragg. Bragg who is known to combine folk and punk rock to create “protest” songs. All this is a bit of pigeonhole for a diverse artist. In the late 1970s Bragg was in a punk band and playing sparse gigs. He'd join the Army but would leave after three months. He started to “busk” around London and recorded a demo tape and by 1984 and official ep was released. He'd release a few more records and by 1996 he had taken some time off to raise his son. Around this time Bragg got together with Wilco to do what would end up being two releases of songs based off incomplete Woodie Guthrie songs. He released a new record in March of 2013. (R.E.M) plays a fine mandolin on “Everywhere” and it is a focal point for sure. 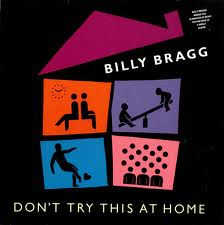 Bragg seems to lay out the records well with burners, then mid-tempo “thinking man” songs. Johnny Marr plays the electric guitar on “Cindy of a Thousand Lives” while Kristy MacColl offers backing vocals. The song has a nice extended solo and the strings are really solid to fill it out. I've noted he's done that before, but when you are know for acoustic guitar political songs, its a noticeable trait. We get an REM tandem on "You Woke Up My Neighbourhood" . Buck returns on the mandolin and Michael Stipe sings backing vocals. This was a very early favorite on the record when I first heard it and it continues to cause a massive grin. The chorus alone is worth it. “Trust” and “God's Footballer” are on that mellower side. “Trust” has clarinet and harmonica, while the latter finds pluck stringed instruments and keyboards. “The Few” has Bragg in fine form and once again pulling in various instruments with trombone that is pushed right to the front. If there is one song that would be know by Billy Bragg by the masses it would have to be "Sexuality". A rollicking fun run that has the return of Marr and MacColl in their roles and one of the most infectious songs, and song titles of the early 1990s. Soak it in all over dear readers. Another great track that may have been missed is "Mother of the Bride". The song is about a man that sees the woman he loves marrying someone else, and his mother realizing he would be better suited than the man she is marrying. Its an acoustic guitar, foot stomping of a song. The line about him seeing the couple after being married..with “he looked boring and she looked bored” are one of the most brilliant lines ever sung in a break up song...even though its not a break up song. After the last two more rocking songs we pull back some with the piano led “Tank Park Salute” which also is the style of “Dolphins” which follows. "North Sea Bubble" is one of my favorite songs on the record, probably top 2 or 3. The urgency, the hooks, the whole feel just grabs me to this day. Over and over again. On come the strings and we calm it down again for “Rumors of War”. The music might be quiet/calm but the lyrics are heavy and the strings give it that chilling feel. “Wish you Were Her” has Bragg surrounded by bass, guitar and four backing vocalists for the fullest, largest group of performers on a single album track. The album closes with “Body of Water” a track that opens with the chorus so you know Bragg means business and goes out on a high note with an up tempo run of acoustic and electric guitar blasts. Where are they now? - As noted Billy continues to write and perform. His latest album “Mr Love & Justice” was released on March 18, 2013. He is married, has a son, loves football and is still politically active. FDF Overall Take - I tend to like the more uptempo stuff from Bragg, and this record has a fair number of songs. They are all well crafted and are fun to listen to, and you might even learn something. I don't know a ton about his catalog but if you were to say you have this record in your collection I'd totally get it. FDF Volume 4 Issue 324 - Sam Roberts - We Were Born In A Flame"
Overview – Sam Roberts was born in Canada soon after his parents immigrated from South Africa in 1974. By 1993 Sam had formed his first band and they had their ups and downs and by 2001 he had recorded his first solo ep. The ep was a slow seller but picked up steam to gain him a record contract. This would be his full length debut and it would win two Juno Awards for Album and Rock Album of the year. "Hard Road". It is evident right away that Roberts is talented. The layers of guitars bass and drums under the poppy/catchy lyrics are complex and interesting. The guitars range from jangle to buzz for the duration “Don't Walk Away Eileen” is another tight rocker. (this one used drummer Jordan Zadorozny). The drums do rumble a bit more more on this one, but the focus is on the pop sensibilities of this track. "Brother Down" was released as a single to the US and the hand claps and guitars all add that “around the campfire” type track. A solid track only made better with the vocal overdubs. A stand out track for sure. The rumble of drums is constant on "Where Have All The Good People Gone?" . Roberts sounds more comfortable on this track, layering vocals over vocals and guitars to boot. A really “full” sounding track. Much of the album to this point is pretty rocking and “Taj Mahal” is the first seemingly attempt to slow it down some. Pianos fill the sound scape with light cymbal work on the ride cymbal. This mid tempo song allows Roberts vocals to be out on his sleeve. Nothing I masked and he seizes the moment to reach deep with his comfortable vocal range. “Every Part of Me” has the focus on Roberts solid bass playing work. Its never overly flashy, but rock solid. Holding court for the guitar lines and the horn section that appears on this track. The duo gets rowdy again on “Higher Learning”. The lyrics are sung about as fast as he as sung on the record and the music as equally as frantic. The Donoso drum fill late to send it all back to the chorus will have you looking for your “air drums” sooner than later. “Rarefied” also has the “bass intro” solo, before the guitar comes in. Roberts vocals are hushed and smooth and come the chorus he seems to “bubble up” some and it has that really solid pop feel he has been so good at crafting. “On The Run” feels like something the White Strips would have done. A driving drum and bass heavy track with the vocals shouted at you accented then with big guitar chops. We quiet things down with a keyboard intro on “No Sleep”. The bass creeps up and then acoustic guitar. “This Wreck of a Lie” is another track on the mellower side, almost beatlesque at times. “Dead End” is a fun rocking romp with a lot of piano in the mix with the guitar bass and drum. We wrap up with “Paranoia” another track that starts off with the solo acoustic guitar that has the slow percussive build. Shakers and light drum taps under the acoustic guitar and Roberts, as always in fine vocal form. The track builds and builds to a frantic conclusion. Well worth your time to not skip this one. Where are they now? 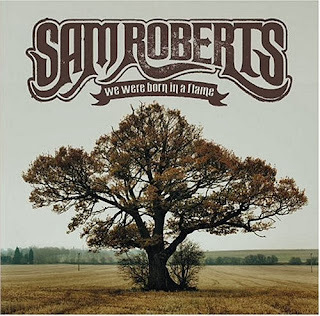 - Now under the moniker “Sam Roberts Band” they released their last album in 2011. According to social media a new album is “in the works”. FDF Overall Take – Honestly it is pretty easy to understand why this record won the awards and accolades is has. Roberts is skilled for sure, and uses the right tools and the right time. The songs are interesting and entertaining. Always curious what direction he will push himself. You'd be well suited to track this album down.